The marching band and color guard placed ninth overall in their division, which qualified them to advance to the Southern California Championships. The band placed 12th overall, and the color guard finished 10th, earning their highest score of the season. The field hockey team qualified for CIF playoffs, and lost a close one in the first round. The boys’ water polo team entered CIF playoffs seeded second, and made it to the semifinal round before being defeated. Girls tennis team members Venous Ghazi (senior) and Maya Gilbert (sophomore) qualified for the individual playoffs, and made it to the second round of play. The football team is still alive in the CIF playoffs. They will play in the championship game this weekend. Seeing a need on campus, staff from the Wellness Center, along with students from the Just for Jesus Club, the Muslim Club, and students involved with the National Alliance on Mental Illness worked together to develop a dedicated space for meditation, prayer, and reflection. A small room has been identified, and the design process is underway. The students partnered with the interior design class and put together a plan to decorate the space. A fundraising account has been posted on GoFundMe.com (“Mindful Moment Room”) to secure funds to complete the project. The group hopes to have the space ready to use when the new semester starts after winter break. 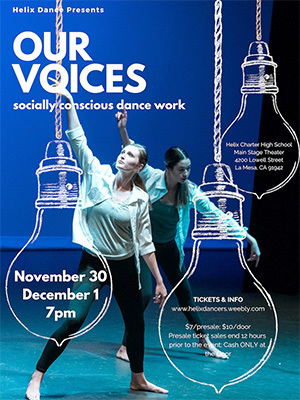 Helix Dance presents “Our Voices: Socially Conscious Dance Work” on Nov. 30 and Dec. 1 at 7 p.m. in the Helix Mainstage Theater. $10 admission. Helix Vocal Music presents “Highland Holidays” on Dec. 17 and 18 at 7 p.m. in the Helix Mainstage Theater. $10 admission. Have you joined the Helix High School Foundation yet? The foundation facilitates fundraising, which promotes the growth and improvement of Helix Charter High School. Funds raised by the foundation are used primarily to fund scholarships for graduating seniors. If you need a unique holiday gift, you can order a custom brick to honor a graduate, favorite teacher or coach, or leave your personal mark on Helix for years to come. Bricks will be placed in the courtyard in front of the administration building. Order forms can be found on the foundation website. Become a member and/or order your brick at helixhighschoolfoundation.com. If you are interested in finding out more about Helix Charter High School, please attend one of our Excellence in Education tours, held monthly. The last tour of 2018 will take place on Thursday, Nov. 29, at 5:30 p.m. Tours will resume on Jan. 17 at 5:30 p.m. Reserve your spot using our website, helixcharter.net.